When we think about Biryani, it is all about meat and traditional non vegetarian dish. But nowadays people are much into vegetarian food and Vegetable Biryani comes to fulfil their desire. But this Biryani is loved by everyone for its unique taste. I used nuts in Biryani but you can use paneer or soya nuggets. For paneer you need to cut into cube, fry it and add when you are layering the biryani. For soya nuggets you need to cook with vegetables. Thanks. soak rice for 30 minutes and boil 4½ cups of water, bay leaf, cinnamon, clove, cardamom, rice and salt in a deep non-stick pan, cover with a lid and cook on a medium flame for about 10 minutes or till rice is about 80% cooked. Strain the rice using a strainer and keep aside. Cut vegetables in big pieces, wash it and keep aside. Heat the oil in a deep non-stick pan and fry sliced onion till it becomes golden brown and keep it aside. In same oil fry the cashew and keep aside. In same oil fry potato and salt for 3-4 minutes; add rest of vegetables and cook 2-3 minutes. Remove vegetables from oil. Same pan add cardamom, cinnamon and bay leaf and fry 30 second before adding ginger paste, poppy seed paste, coriander powder, green chilli and pepper corn; cook 1-2 minutes and add yogurt. Stir gravy and add vegetables; cook on a medium flame for 4 to 5 minutes while stirring occasionally. Mix saffron colour with 2 tablespoons water in a bowl. 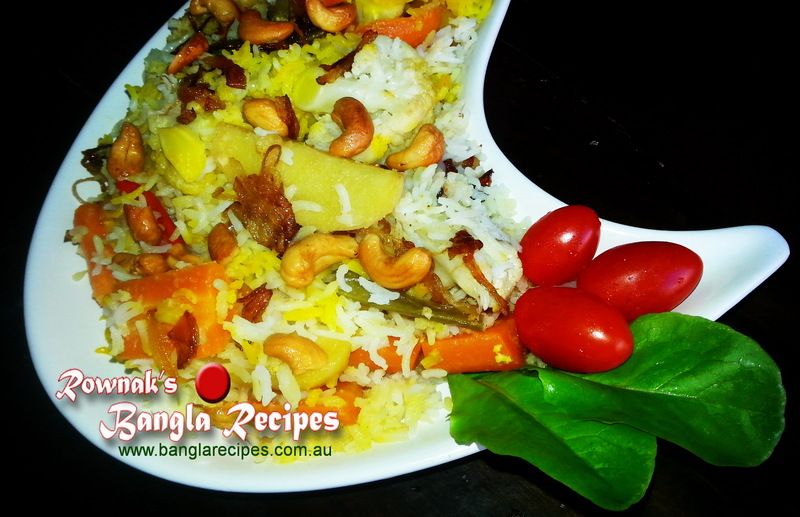 In a thick bottom sauce pan layer rice and vegetables and spread ghee, sugar, 2/3 fried onion, cashew nuts evenly. Pour saffron mix water and cook the sauce pan on a slow flame for about 15-20 minutes under closed lid. 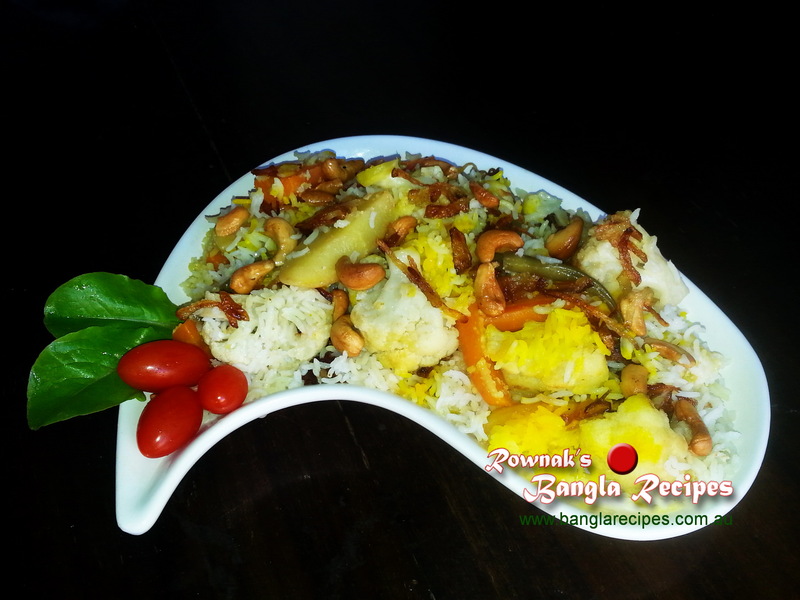 Serve hot Vegetable Biryani with rest of fried onion. I love to add cashew nuts just before to keep it crunchy. You can use powder of cardamom, cinnamon and pepper corn. 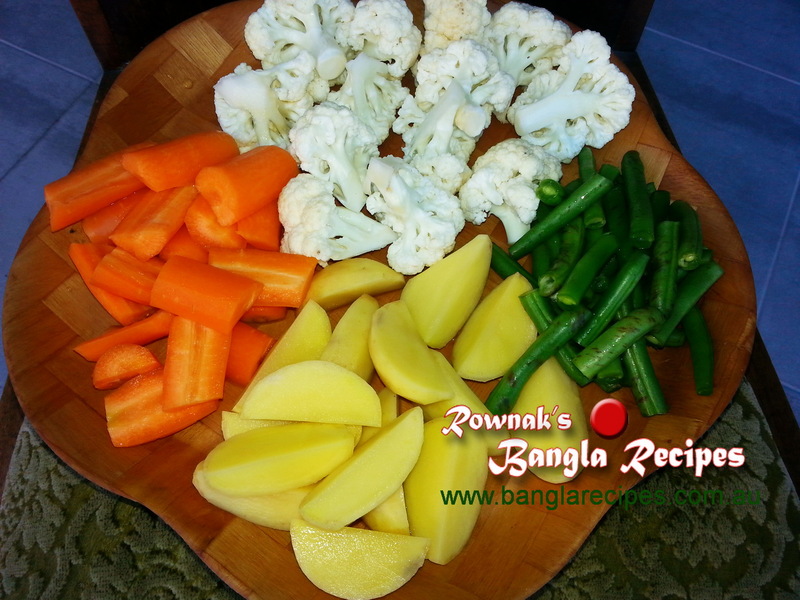 Love your website, and the yummy Bengali food recipes you post. I was born in Calcutta, and came out to Australia when I was in my teens, and have lived here for over 46 years. What is the equivalent of Hilsa Fish over here? Hi Sandra, you pick wrong person to ask this question. I will nt compare Hilsa with any fish. I know,love and love Hilsa . But some people say that Mullet has a tiny winy similarity with Hilsa. You can try to check that. Thanks. Veg. Biryani, I lovr it. You r really great in testy cookings. you can add soya nugget in vegetable Biryani and I will post soon some soya nugget recipes. Keep in touch and thanks.